To whom is private wealth intended for? 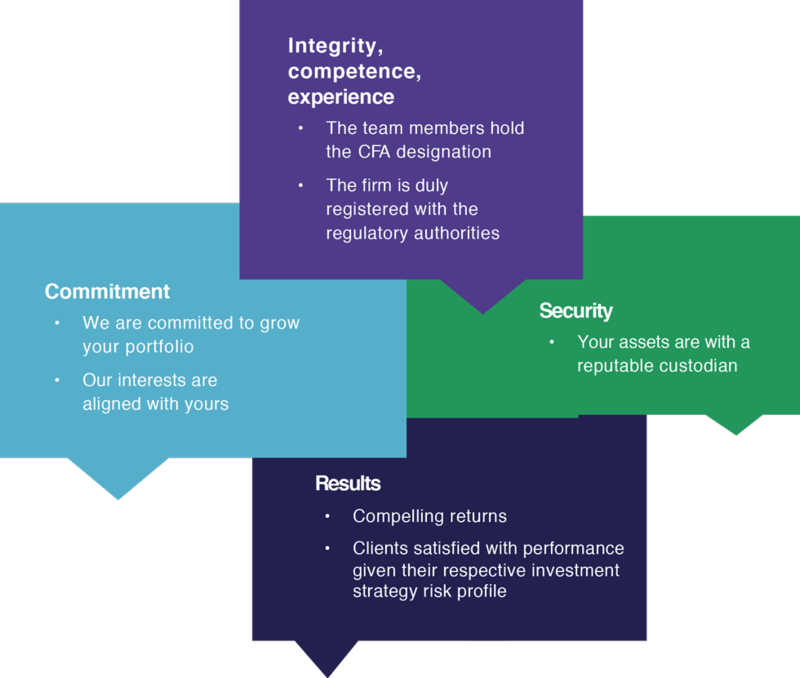 Why choose a CFA Charterholder* ? Private wealth management is intended for clients with assets of more than $150,000 to invest who are looking for a complete and performing solution. Access to an external multidisciplinary team able to help you with all your financial needs, such as financial planning, tax planning and accounting, etc. Please do not hesitate to contact us so that we can assess your financial situation and recommend a personalized solution which reflects both your needs and investment goals. 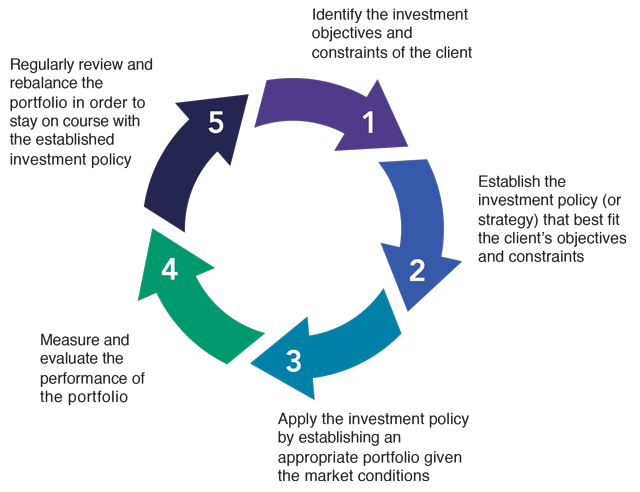 At Rivemont, the management of a private wealth portfolio rest upon five main steps that constitute a cycle. On an ongoing basis, the portfolio is reviewed and rebalanced in accordance with the established investment policy. We also make sure to review at least annually any changes in your personal situation that would translate into a new objective or constraint in the management of your portfolio. 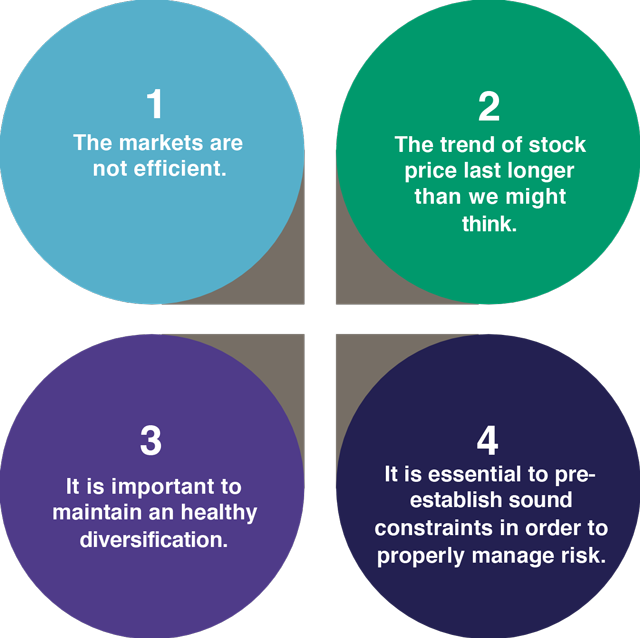 We believe that the stock price does not always reflect its intrinsic value: it is influenced by a number of factors, including several cognitive biases on the part of investors. It is possible to make investment decisions based on these recurring behaviors. 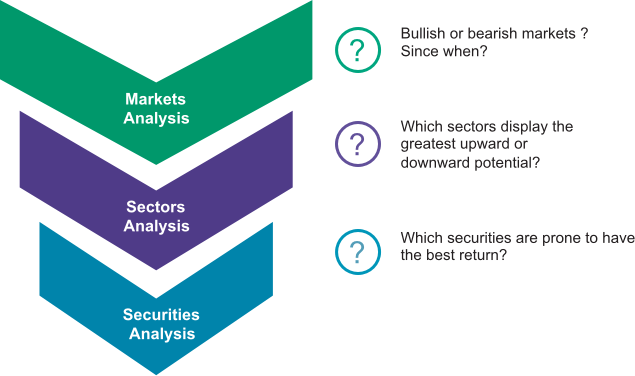 Our investment methodology for stock selection and portfolio construction is entirely top-down. As a first step, we will analyze the market as a whole, then the behavior of the activity sectors and finally we will settle our choice on the most attractive securities. We use a set of well-defined rules for the purchase and sale of securities, which enables us to eliminate all cognitive and emotional biases from the management of your portfolio. One of the great advantage of our methodology is that it can be heavily underweighted in equities and bonds when these markets drop or crash, which can prevent significant losses within the client portfolios. We hereby present three investment strategy models that we offer to our private wealth clientele. For each investor, we review his financial and personal situation and we establish an investment strategy that is suited to his constrains, needs and objectives. The moderate growth investment strategy combines fixed-income securities with investments that have the potential to increase in value. For example, this portfolio may include bond securities that will provide a regular income, and combine them with common shares that benefit from a capital appreciation potential of over the mid to long-term (though they are not immune to declining stock markets). The strategy also includes a small allocation to the Rivemont Absolute Return Fund which provides a healthy diversification to the strategy. To view the strategy profile, click here. The growth strategy aims to grow the invested capital when the investor does not need substantial investment income at regular intervals. The portfolio consists mainly of common shares in companies that have high appreciation potential as well as an allocation to the Rivemont Absolute Return Fund, which by its negative correlation to the stock markets, offers a nice balance, especially in down markets. The portfolio focuses on capital growth, but also includes a small proportion of fixed-income securities. The growth strategy is considered risky. It is particularly well suited for young adults who are beginning to invest for retirement and whose investment horizon is relatively long. The aggressive growth strategy is the riskiest and provides greater expectations of an important growth of the invested capital. This portfolio includes common shares but also a more important allocation to the Rivemont Absolute Return Fund. That alternative fund aims a positive absolute return in all market conditions. The complexity of today’s financial markets demonstrates just how important it is to carefully choose your financial adviser and have reliable evidence of his integrity, experience, and commitment. No credential is as widely regarded in the global financial industry for its rigorous focus on current investment knowledge, analytical skill, and ethical standards as the Chartered Financial Analyst (CFA) designation. Credible: Adheres to a code of ethics that puts the client’s interest first and masters a comprehensive body of investment knowledge. Committed: Demonstrates professional experience and has the perseverance to undergo a series of exams known for their high difficulty level. Current: Possesses the latest and most relevant investment knowledge. Connected: Is a member of a network of more than 100,000 investment professionals in over 130 countries. The globally-recognized CFA designation symbolizes the knowledge, professionalism, and integrity you should expect from a financial adviser. Make an appointment today with our portfolio manager. We will be happy to contact you within the next 48 hours. For any questions, do not hesitate to contact us directly. Subscribe to our financial letter! On a quarterly basis, we mail out a financial letter to all of our current and potential clients. In order to be added to the mailing list, please enter your full name and email address below.